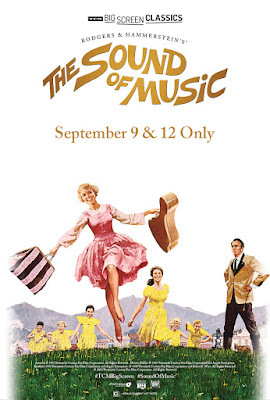 One of the most popular and enduring movies of all time, Rodgers & Hammerstein's "The Sound of Music" has delighted audiences for more than half a century, and on September 9 and 12, it returns to movie theaters nationwide as part of the yearlong TCM Big Screen Classics series from Fathom Events and Turner Classic Movies (TCM). In addition to the full feature presentation, TCM Primetime Host Ben Mankiewicz will offer special, brand-new commentary both before and after the film. Julie Andrews and Christopher Plummer star in director Robert Wise's spectacular cinematic adaptation, which features such iconic musical numbers as the title song, "Sixteen Going on Seventeen," "Do-Re-Mi," "My Favorite Things," "The Lonely Goatherd" and "Edelweiss," as it tells a stirring story of love, family and personal sacrifice. Tickets for The Sound of Music can be purchased beginning July 27, at FathomEvents.com and participating theater box offices. Presented by Fathom Events, Turner Classic Movies and Twentieth Century Fox Home Entertainment, "The Sound of Music" plays in more than 600 movie theaters nationwide on September 9 and September 12 at 2:00 p.m. and 7:00 p.m. local time (both days). A complete list of theater locations will be available July 27 on the Fathom Events website (theaters and participants are subject to change). The first movie in Hollywood history to gross more than $100 million, "The Sound of Music" originally played in movie theaters for a year or more upon its initial release and remains one of the most successful films ever made. The TCM Big Screen Classics presentation of "The Sound of Music" will be presented in its original widescreen "roadshow" version, including a mid-film intermission. "The Sound of Music" was nominated for 10 Academy Awards®, and won five Oscars®, including Best Picture (1965), Best Director, Best Scoring of Music – Adaptation or Treatment and Best Film Editing. "'The Sound of Music' is the definition of a 'feel-good' movie, a film that captures the hearts of audiences of all ages in the most special way," Fathom Events Vice President of Studio Relations Tom Lucas said. "It's one of our most frequently requested best-performing classic titles, truly one of movie lovers' favorite things. We couldn't be more pleased to add 'The Sound of Music' to this year's TCM Big Screen Classics series." Fathom Events is the leading event cinema distributor with theater locations in all top 100 DMAs® (Designated Market Areas) and ranks as one of the largest overall theater content distributors. Owned by AMC Entertainment Inc. (NYSE: AMC), Cinemark Holdings, Inc. (NYSE: CNK) and Regal Entertainment Group (NYSE: RGC), Fathom Events offers a variety of unique entertainment events in movie theaters such as live performances of the Metropolitan Opera, top Broadway stage productions, major sporting events, epic concerts, the yearlong TCM Big Screen Classics series, inspirational events and popular anime franchises. Fathom Events takes audiences behind the scenes for unique extras including audience Q&As, backstage footage and interviews with cast and crew, creating the ultimate VIP experience. Fathom Events' live Digital Broadcast Network ("DBN") is the largest cinema broadcast network in North America, bringing live and pre-recorded events to 941 locations and 1,496 screens in 181 DMAs. The company also provides corporations a compelling national footprint for hosting employee meetings, customer rewards events and new product launches. For more information, visit FathomEvents.com. Turner Classic Movies (TCM) is a two-time Peabody Award-winning network that presents great films, uncut and commercial-free, from the largest film libraries in the world highlighting the entire spectrum of film history. TCM features the insights from Primetime host Ben Mankiewicz and Saturday daytime host Tiffany Vazquez, plus interviews with a wide range of special guests and serves as the ultimate movie lover destination. Currently in its 23rd year as a leading authority in classic film, TCM offers critically acclaimed series like The Essentials, along with annual programming events like 31 Days of Oscar® in February and Summer Under the Stars in August. TCM also directly connects with movie fans through events as the annual TCM Classic Film Festival in Hollywood, the TCM Big Screen Classics series in partnership with Fathom Events, as well as through the TCM Classic Film Tour in New York City and Los Angeles. In addition, TCM produces a wide range of media about classic film, including books and DVDs, and hosts a wealth of material online at tcm.com and through the Watch TCM mobile app. TCM is a division of Turner, a Time Warner company, Turner creates and programs branded news, entertainment, sports, animation and young adult multi-platform content for consumers around the world. Turner brands and businesses include CNN/U.S., HLN, CNN International and CNN.com, TBS, TNT, TCM, truTV, Cartoon Network, Boomerang, Adult Swim, Turner Sports, Bleacher Report, FilmStruck, Super Deluxe, iStreamPlanet and ELEAGUE.